It seems everyone is offering business storytelling training these days. It was certainly rare when we started working with stories 10 years ago but all that’s changed. Everyone is calling themselves a storyteller, every company, product and services ‘must’ have a story and every man and his dog is offering business storytelling training. If you’re looking for business storytelling training that delivers for your leaders, how do you decide which training to choose? What makes a good program? While this advice I’m about to share is not free from self-interest, we offer a business storytelling program, I’m going to do my best to describe what I think a good program should have. Anyone teaching business storytelling must be proficient at telling business stories. Storytelling is a craft learned through imitation and practice. Just as good writers are good readers, good storytellers are great story-listeners. But not everyone who is attempting to teach storytelling are storytellers. I remember attending a conference in Singapore and watched one of the speakers talk about business storytelling and in his 45 minute presentation didn’t utter a single anecdote. We heard that stories are memorable and how people are hardwired to understand stories etc. etc. but without using stories to illustrate the point. In my mind, it was a failure. Leaders in large organisations should learn business storytelling from people who have worked in large organisations. Teachers with corporate experience understand the culture and constraints as well as the opportunities corporate life offers for business storytelling and this experience helps both teacher and journeyman speak the same language. Corporate experience matters because storytelling seems so foreign for many executives. They want to feel comfortable that they are being guided by someone who has done it before with people just like them. A single workshop doesn’t change behaviour because storytelling is a habit requiring persistence and repetition to develop. Charles Duhigg’s excellent review of habit research shows us that creating a new habit is a process of finding a cue, executing a behaviour, and savouring a reward.1 If we apply it to forming a storytelling habit it starts when something happens that reminds you to share a story (the cue), you then share it (execute) and then experience pleasure (the reward). The pleasure comes from seeing the influence your story creates, how it changed people’s minds or even inspired action. It can take up to a year to develop a habit and repetition of the new behaviour in the early stages increases the chances of a habit forming.2 So after the initial training the student needs ways to remind them to find and share business stories at work and then to notice the positive impact it has. After time they’ll crave sharing stories and the behaviour will become automatic. A new habit has formed. So look for business storytelling training that has an ongoing program that triggers practice every week or every month at least for six months. Developing the business storytelling habit requires dogged determination but it also requires practice. Actually it requires a special type of practice known as deliberate practice. Malcolm Gladwell popularised the idea of deliberate practice with his 10,000 hour rule to mastery. But it has to be more that just practice. If that was the case taxi drivers would be the world’s best drivers. Deliberate practice takes a focus on improving performance and working on weaknesses. While we are now learning that deliberate practice is not the whole story,3 speak to any coach and they will tell you, practice makes perfect. Deliberate practice requires coaching. Students of storytelling benefit from timely feedback applied to real world problems. And they thrive on goals. There are two areas where story coaching makes a difference: 1) helping executives see the many ways story approaches help the tasks at hand such as communicating their strategy, convincing their board to approve their budget, inspiring action, teaching a lesson, illustrating values; and 2) listening to their stories and helping them find the specific, visual moments rather than telling the high-level, and ultimately bland and ineffective, version. In addition to one-on-one coaching, seek out programs that include peer coaching where a cohort of learners work together over time to improve their storytelling skills. Peer coaching can be done online, face to face or on the phone. It usually involves a peer telling a story of how they tried to use their new skills and asking the advice of the group of how they could have done it better. Apart from building capability, the cohorts develop a bond that serves them into future collaborations. Some people learn best by just giving it a go and seeing what happens. Others need to read about how to do. While some like to see a video or two showing them how it’s done. We all have our preferences for learning and therefore it’s important to seek storytelling training that engages a range of learning styles. Look for materials that are more than just a print out from the Powerpoint deck. Has the workshop material been well thought out, research-based and professionally presented? Would you be proud to share the materials with your colleagues and your leadership team? What supporting material can they provide? Do they have a blog, white papers, newsletter, learning videos? All this effort developing storytelling skills is worthless unless you can detect real benefit from the effort. 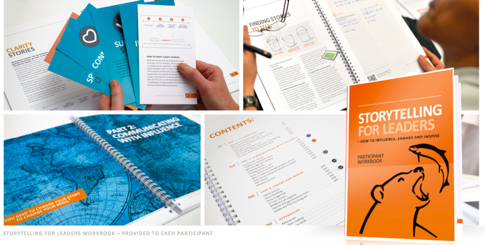 Successful business storytelling training should demonstrate the effectiveness of the program with case studies, testimonials, before and after survey results and, dare I say it, stories of where business storytelling has worked. These are some of the important features of an effective business storytelling training program. Please let me know if you have seen others make a real difference in how leaders learn business storytelling.